What It’s About: Eccentric cops Jimmy “Popeye” Doyle (Gene Hackman) and Buddy Russo (Roy Scheider) attempt to work their way up a drug smuggling operation taking heroin into New York via Marseille. Why Watch it Today? : Today is the UN’s International Day Against Drug Abuse and Illicit Trafficking. 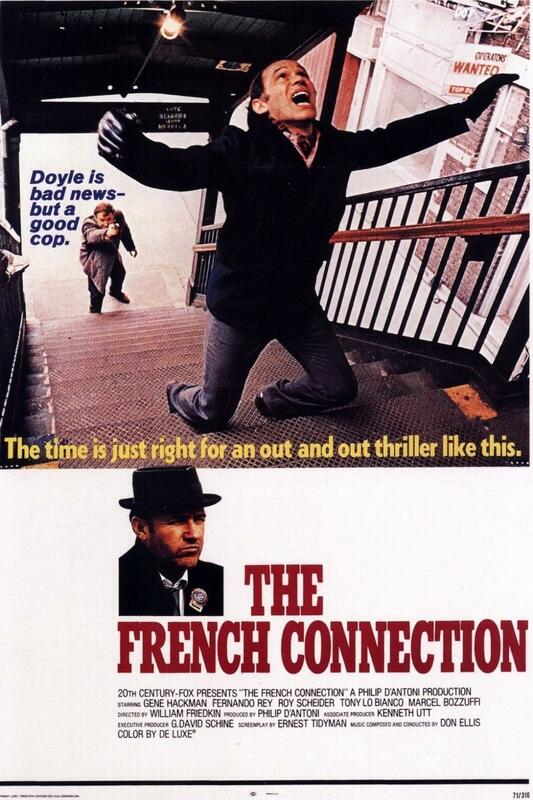 Although The French Connection is probably most famed for its harrowing chase sequence through crowded New York streets that director William Friedkin shot guerrilla style, it is an excellent crime drama, and set the template for many drug investigation movies to come. Other Choices: Cleopatra Jones, Coffy, Foxy Brown, Quiet Cool, Avenging Disco Godfather…. This entry was posted in "Based on a True Story", Action, Adaptation, Based on a Book, Cops, Crime, Independent, Movie of the Day and tagged Alan Weeks, Best Actor, Best Adapted Screenplay, Best Cinematography Nominee, Best Director, Best Film Editing, Best Picture, Best Sound Nominee, Best Supporting Actress Nominee, drug dealers, drugs, Ernest Tidyman, Fernando Rey, Frank Adonis, Gene Hackman, heroin, New York City, Roy Scheider, subway, Tony Lo Bianco, William Friedkin.